(CNN) -- Director Chen Kaige's films often examine the close ties of love, passion and friendship, but his own relationship with his artist and filmmaker father is one that has informed much of his life and colored his work. Chen Kaige captures the pains and passions of relationships on the silver screen. As a 14-year-old red guard during the Cultural Revolution, Chen denounced his father for creating subversive art. While his father forgave him, Chen has found it hard to truly forgive himself. "I knew it was the wrong thing to do. If I didn't know, then I could've forgiven myself," he told CNN. Chen has already touched upon such a significant moment in his personal life in his award-winning 1993 film, "Farewell My Concubine." It brought him international-acclaim and a host of accolades, including Cannes Film Festival's Palme D'or. Like "Farewell My Concubine," Chen's latest film, "Forever Enthralled" ("Mei Lanfang" in Mandarin), once again delves into the world of Beijing opera, and it has proven to be a hit in China since its release in cinemas in December. However, capturing the Cultural Revolution remains one of Chen's ambitions -- not only to explore the circumstances that colored the relationship with his father but an exploration of a crucial time in Chinese history. "It's not because I was hurt and so many people hurt that I want to do my revenge. It's not like this. This is the lesson that the Chinese people must learn, no matter what," Chen told CNN. "I hope that my generation of directors or writers could do something to tell people the truth, to tell people what really happened at that time; why a young son of a film director, you know, could denounce his own father, like I did. I was still shocked," he said. 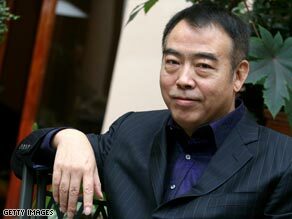 Now 56 years old, Chen studied at the Beijing Film Academy, directing his first feature film "Yellow Earth" in 1984. After the success of "Farewell My Concubine," he eventually took up the offer to direct a Hollywood film in 2002 -- "Killing Me Softly," with Heather Graham and Joseph Fiennes. While failing to impress the critics or register a hit at the box office, Chen remains sanguine about the experience. "I think I've learnt a lot from that. Although I fully understand why audiences didn't really enjoy that film that much. "In the industrial system [of Hollywood] people don't really care if you're making a good film or not. People care about whether the film can make money. It's a completely different thing, you know. Quite honestly, I wasn't very comfortable to do films that way," said Chen. Chen will continue to make films in China and finds the country's recent transformation as significant as earlier periods of change during his lifetime. "I ask myself whether it's a progress or we're just going back to where we not necessarily need to be. I don't know. I mean, I'm not trying to say anything politically. But I feel if you look at the very beginning of Charles Dickens' novel, 'A Tale of Two Cities,' 'It was the best times, it was the worst times...' this is the simple answer," he said. Time will tell if today's China will be part of Chen's cinematic sweep in the future.